Native Americans' ancestors were slaughtered, but they should be thankful anyway, the op-ed suggested. By Amy AnthonyThe Brown University campus newspaper apologized Wednesday after publishing what it says were two "deeply hurtful" and racist columns. The Brown Daily Herald's editorial board published an editor's note saying it regretted the hurt caused by the two opinion columns, both written by student M. Dzhali Maier. 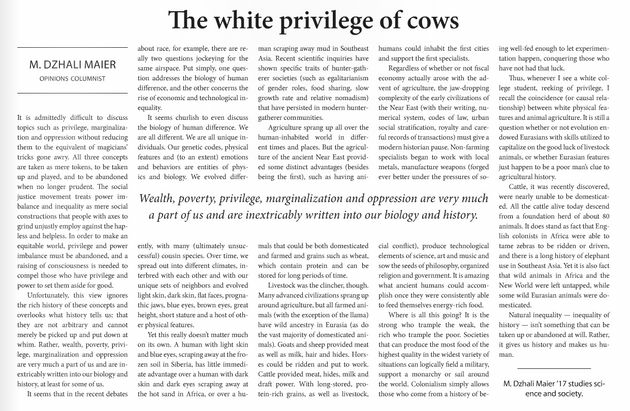 One titled "The white privilege of cows," which was published Monday, "invoked the notion of biological differences between races," while "Columbian Exchange Day," published Tuesday, argued that Native Americans should be thankful for colonialism, according to the editor's note. By Amanda GirardThe White Privilege of Cows made the argument that European societies that developed agriculture were more capable than hunter-gatherer societies, and that a steady supply of crops and livestock allowed colonial empires to build up a military, develop technological advancements, and use those developments to sail the world in search of new lands to conquer. Even though the concept of racial superiority has been repeatedly debunked, the author of the column went a step further. Maier suggested that native populations who were enslaved and systematically eradicated by these colonists ultimately benefited by assimilating into the agriculture-based lifestyle forced on them through colonial oppression, and that society was ultimately better off due to the technological developments that took place after colonization. The Brown University student also suggested that pre-colonial native populations were inferior due to not having domesticated animal populations. Maier’s op-ed also proposed the idea that colonists in Africa and the Americas did everyone a favor by taming and domesticating animals (after the enslavement and genocide of native populations, which was left out). Maier spends almost half this column talking about racial differences. She then switches to cultural differences, a completely different topic. As noted in the first paragraph above, she talks about the amazing things accomplished by Near Eastern civilizations. One, the civilizations of the Americas produced many of the same things: agriculture, writing and math, art, religion, philosophy, architecture, astronomy, medicine, etc. Two, these accomplishments had nothing to do with racial characteristics. Maier talks about biology, but the only biology in play here is access to better crops and livestock. Near the end, Maier asks whether the link between race and culture is correlation or causation. In her final paragraphs, she implies it's causation. For instance, British colonists domesticated zebras, she claims, whereas African natives couldn't. The Story of... Zebra and the Puzzle of African AnimalsPerhaps the most puzzling question Jared Diamond encounters as he investigates animal domestication is: Why were no large mammals ever domesticated in tropical Africa? Africa, south of the Sahara, is home to the richest diversity of animal life on the planet, including some of the largest mammals on earth. So why did the Africans never domesticate the rhino? Why did they never farm the hippo? The elephant? Or the giant wildebeest? Perhaps most strangely of all, given the importance of the horse to European history, why did tropical Africans never domesticate their own species of wild horse, the zebra? Zebra are closely related to the domesticated horse, sharing a genus (Equus) and a common ancestor. They stand nearly five feet at the shoulder, live in small family groups or herds, are sociable herbivores who breed well in public and live in harmony with their mammalian neighbors, like antelopes and wildebeest. They are even strong enough to carry an adult human on their backs. Zebras are also notoriously difficult to catch. They have evolved superb early-warning mechanisms, such as peripheral vision far superior to other horses. Often bad tempered, they grow increasingly antisocial with age and once they bite, they tend not to let go. A kick from a zebra can kill—and these creatures are responsible for more injuries to American zookeepers each year than any other animal. Pity the poor human, therefore, who might try to domesticate a zebra in the wild. During the colonial era, some adventurous Europeans tried to harness this African horse. Lord Rothschild famously drove a zebra-drawn carriage through the streets of Victorian London. Yet these creatures were never truly domesticated—they were never bred and sustained explicitly under human control.Western Civ is best? Maier is basically gushing about Western Civilization while pooh-poohing non-Western civilizations. There's no attempt at balance here--no mentions of European horrors such as the slave trade, the extermination of native populations, and the Holocaust. Her goal is to tout the superiority of white civilizations. She tries to fudge this by referring to "Eurasians," but there are no specifics about the great cultures of China or India. With the notable exception of the Mongols, these civilizations did not try to colonize the world. Why not? Because being "well-fed" and "strong" like these Asian cultures doesn't necessarily lead to conquest. What leads to conquest is a religious or philosophical belief that you're a chosen people who deserve to rule. That it's your God-given duty to bring the "light" of "civilization" to the dark (-skinned) corners of the globe. It's that kind of attitude that drove all the soul-crushing civilizations of Europe, including Rome, Britain, America, Germany, and the USSR. For more on Western Civilization, see King Touts "Values Columbus Brought" and Alternatives to "Got Land?" Shirt.